The launch and draws for the third level colleges’ senior rugby cup competitions took place in the Aviva Stadium, on Friday January 21st. 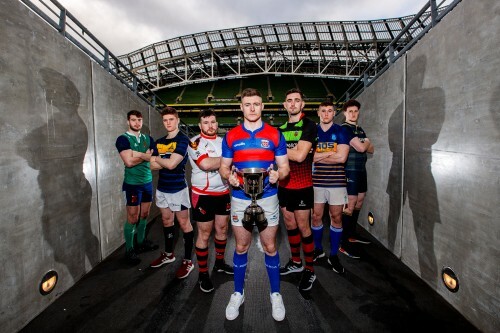 Forty-Seven college rugby teams will participate in five cup competitions coordinated by the IRFU and Student Sport Ireland, the governing body for third level sport on the island of Ireland. Brendan Johnston Cup champions from 2018 Garda College will open their defence of the title away to TU Dublin City Campus, Athlone IT against Limerick IT in Athlone is a very tasty quarter final, with the third quarter final pairing of Dublin City University v Ulster University, where the winner of that game will be at home to IT Carlow in the semi-final. The quarter finals will take place on February 13th. The new Women’s Rugby Tier 1 Cup competition is played on a round robin basis and sees teams split into two groups of three. Group A sees Dublin City University ‘A’, University College Cork and University of Limerick ‘A’ together, while group B is made up of IT Carlow, University College Dublin ‘A’ and NUI Galway. Guest of honour at the event was Mr. Brendan Johnston after whom the Senior Men’s Cup Competition is named. During his thirty five years as Sports Officer and lecturer at Dundalk Institute of Technology Mr. Johnston was an advocate for third level sport with a passion for rugby, serving as Hon. Secretary to the Irish Colleges Rugby Union for many years. Players, coaches and representatives of third level colleges attended the launch which was addressed by Ms. Carmel Lynch, Student Sport Ireland Chairperson and Mr. Nicky Comyn, Vice President, Irish Rugby Football Union. Ms. Lynch said “On behalf of Student Sport Ireland I am proud and delighted to attend today’s event to launch our colleges’ rugby cup competitions. It is great to be launching the new Women’s Cup competitions for 2019 season, as it ties in with the 20×20 campaign that both Student Sport Ireland and the IRFU are supporting”. Ms. Lynch also confirmed that Athlone IT in association with Buccaneers RFC will host the finals day again this year, “We are delighted to be going back to Athlone IT and Buccaneers RFC this year, everyone that was there last year was blown away by their facilities and organisation of the finals, and we look forward to more in 2019” said Ms. Lynch. In his address Mr. Comyn complemented both the IRFU and Student Sport Ireland on the progress that has been made since 2011 specifically acknowledging the work being undertaken within colleges by volunteer coaches and sports staff in the development of third level rugby. Mr. Comyn said ‘We are delighted that we now have 47 teams heading into action in the Men’s and Women’s Cup competitions. 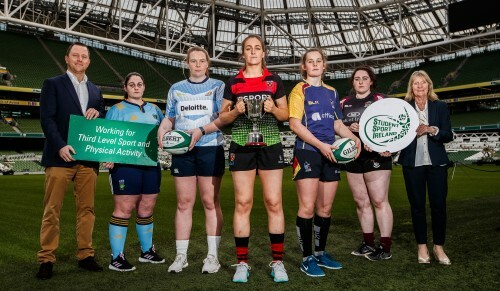 The partnership between Student Sport Ireland and the IRFU has been great to develop competitive rugby and has seen a huge growth in participation numbers.”. The draw for all the cups are as follows.